Iowa’s landscape is divided into about 1,600 watersheds that span about 22,000 acres apiece. It’s in these individual watersheds that progress is being made toward keeping nutrients on the land and out of water. Local people, acting as one community with a myriad of support from experts and a thorough watershed plan makes the difference. Progress on such a big rural scale – Iowa’s 23 million acres of agricultural land – can be confusing. For example, statewide adoption rates of cover crops sit around 2 percent statewide. By contrast, in communities with a watershed plan and implementation funding, the cover crop adoption rate rises to about 15 percent. A watershed is an area of land that drains to a single point. Each watershed possesses unique characteristics and communities. When experts develop a plan for improvement, a number of steps are taken with a broad set of stakeholders to define the existing conditions, identify challenges and opportunities and to chart a path forward. Together. The efforts of local landowners will be a factor in the effectiveness of implementing water quality and conservation practices. “Locally driven efforts have proven to be successful for implementing practices on the land,” said Karl Gesch, watershed coordinator and resource management specialist for the Iowa Soybean Association’s (ISA) Environmental Programs and Services team. “Watershed plans enable stakeholders to see and consider how practices perform which may or may not fit their fields and operations,” says Roger Wolf, Director of ISA’s environmental programs. “For example, an edge of field bioreactor practice might not be possible on every farm and in certain locations this practice may perform better than in other locations. Watershed plans provide flexibility to target practices in the landscape while giving a roadmap for scaling-up implementation. There are a number of urban and rural conservation practices that have the potential to be effective to improve water quality within a watershed. On the urban side, rain gardens, bioretention cells, permeable pavers all require good designing and planning to be effective. 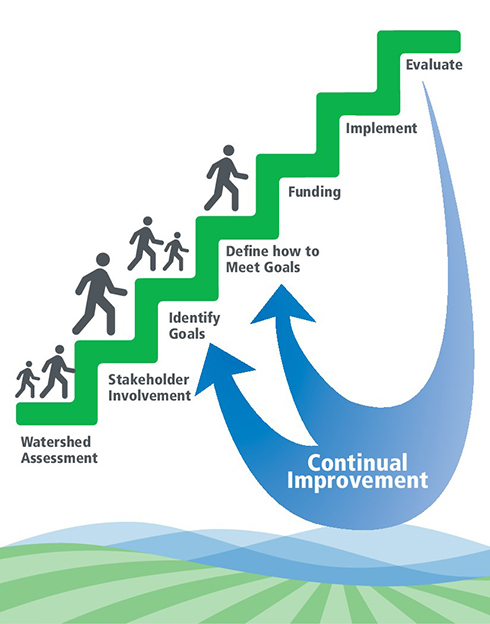 Iowa’s water quality improvement strategy outlines several rural practices that can be effective, recognizing the variability that exists in the weather, geographical landscape and soil types. Farmers can plant cover crops, install bioreactors and terraces, construct a wetland, and practice no-till or strip-till, nutrient management and/or extended crop rotations. “If we look at it from a watershed approach, we can pick and choose practices that are custom-fit for each field that will be the most effective for improving water quality,” said Gesch.